1Optical Sciences, MESA+ Institute for Nanotechnology, University of Twente, Enschede, The Netherlands. 2Institute for Inorganic Chemistry, University of Ulm, Ulm, Germany. 3Institute of Theoretical Chemistry, University of Vienna, Währinger Str. 17, 1090 Vienna, Austria. 4Stratingh Institute for Chemistry, Faculty of Mathematics and Natural Sciences, University of Groningen, Groningen, The Netherlands. 5SRC for Solar Energy Conversion, School of Chemical Sciences, Dublin City University, Dublin 9, Ireland. Photocatalytic water splitting is a promising approach to produce solar based renewable hydrogen. Understanding the photodynamics that follow upon optical excitation is of prime importance for the design of efficient photocatalysts. We synthesized two closely related Ru(II)-polypyridine-Pt(II) photocatalysts (Figure 1) which show a remarkable difference in turn over numbers (TON). RuPt (left) shows a TON of 99 within 18 hours. Interestingly, functionalizing the peripheral ligands with ester groups (right) increases the TON to 720. 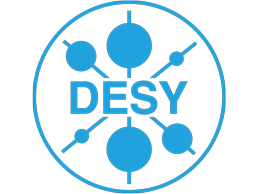 We have studied the photophysics by ultrafast transient absorption and photoluminescence in combination with DFT calculations. An important aspect to address involves the nature of the metal. 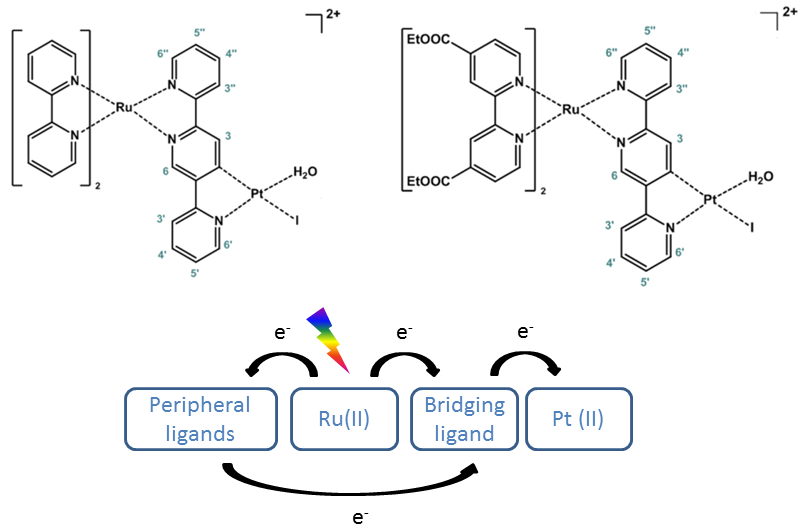 For RuPt we observe a similar ps inter-ligand electron transfer process from the peripheral ligands to the bridging ligand (acting as an electron reservoir) as we reported recently for the equivalent RuPd complex. Functionalizing RuPt with ester groups leads to remarkable changes in the photorelaxation pathways and the electron storage position, strongly increasing the H2 TON value. This insight provides a new design concept for efficient molecular photocatalysts. Figure 1: Structure of [Ru(bpy)2(2,5tpy)PtI(H2O)]2+ (left, RuPt) and [Ru(dceb)2(2,5tpy)PtI(H2O)]2+ (right, EtRuPt).The panel below shows a generally accepted picture of intramolecular electron transfer processes induced by photoexcitation, with the bridging ligand acting as electron reservoir. M.G. Pfeffer, B. Schäfer, G. Smolentsev, J. Uhlig, E. Nazarenko, J. Guthmuller, C. Kuhnt, M. Wächtler, B. Dietzek, V. Sundström, S. Rau, Angew. Chem. 54 5044 (2015). G.S. Bindra, M. Schulz, A. Paul, R. Groarke, S. Soman, J.L. Inglis, W.R. Browne, M.G. Pfeffer, S. Rau, B.J. MacLean, M.T. Pryce, J.G. Vos, Dalton Trans. 41 13050 (2012). Q. Pan, F. Mecozzi, J.P. Korterik, D. Sharma, J.L. Herek, J.G. Vos, W.R. Browne, A. Huijser, J. Phys. Chem. 118 20799 (2014).